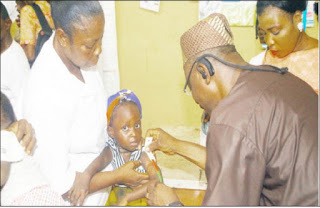 Dr. Nofiu Aigoro, Permanent Secretary, Ogun State Ministry of Health, attending to an infant during a malnutrition management training to mark this year’s World Health Day, in Abeokuta, recently. 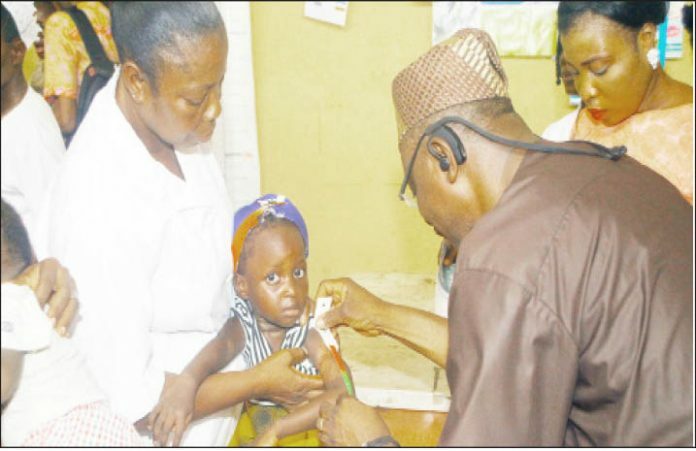 Nestlé Nutrition Institute Africa (NNIA) in collaboration with the Ogun State Ministry of Health conducted a training for primary healthcare professionals in Abeokuta, weekend to mark this year’s World Health Day. According to NNIA, this year’s theme, “Universal Health Coverage: Everyone, Everywhere,” which focuses on ensuring that all people can get quality health services, where and when they need them, without suffering financial hardship professionals is in line with NNIA’s vision and mandate. Various primary healthcare professionals from 110 from Abeokuta North local government area of Ogun state attended the one-day training tagged, “Malnutrition in the First Years of Life: Its Assessment and Management’’ which held at Nigeria Medical Association (NMA) house in Abeokuta. According to him, this situation calls for urgent multi-stakeholder action. “Nestle Nutrition Institute Africa is therefore happy to collaborate with the Ogun State Government in its efforts to address malnutrition in the first 1000 days of life. This is in line with our commitment to bridge the gap between science and the practical application of nutrition to ensure a healthier, brighter future for children. “Currently, about 800 million people, which constitute 12 per cent of the world’s population, spend at least 10 per cent of their household budget on health needs. Of this number, about 100 million suffer financial hardship because of out of pocket health expenditure and half of the world’s population is unable to obtain essential health services, due to poverty.” Ipaye stressed. Ipaye said that the World Health Day 2018 celebration and intervention programme provided another opportunity for strengthening the healthcare system in the state with the support of stakeholders like NNIA through its capacity-building training to primary Health Care Professionals (HCPs) on weekend. Ipaye also revealed some of the measures the state has put in place to improve maternal and child health. One of these according to him is a state funded social insurance scheme popularly called “Araya”. He disclosed that since its inception in 2014, the scheme has enrolled over 23,000 people. The commissioner expressed his appreciation to NNIA for providing support towards the delivery of the health mandate of the administration. He also thanked the HCPs for making themselves available for the training and encouraged them not to keep the knowledge to themselves, but also to do well to transfer the same to their family members and colleagues who did not have the opportunity to participate in the training. NNIA is an institute that shares leading science-based information and education with Health Care Professionals.